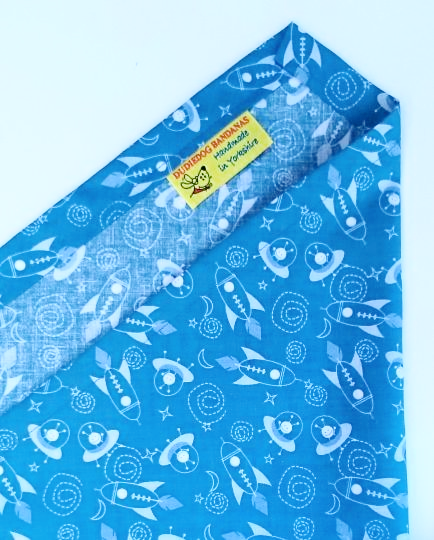 A fun Space explorer dog bandana, perfect for fans of Astronomy or Aliens! The background is a beautiful shade of soft mid blue, with a white print incorporating rockets, spaceships, Martians, stars and moons. 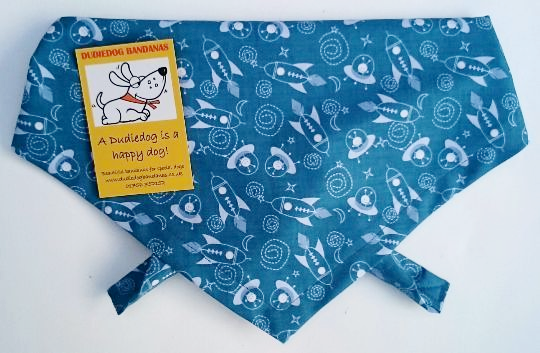 This bandana is from our premium range, and is made from a lovely designer cotton with a great smooth feel. Individually packaged with fitting/care instructions. A perfect doggy gift! "Bought this for my boy when he was a puppy, Super cute! The quality cotton withstands puppy mischief really well and is washable at 40, so good to get rid of any grubby puppy mess!"